On March 19 my husband Bob and I flew to Israel for just over two weeks…with no tours planned or booked. We did know that our first five nights would be with Servas hosts and trusted that all would be well. Our whole trip was wonderful! Ruthie U. welcomed us to her home in Tel Aviv for three nights. She had stayed with us in 2015, and was happy to show off the seashore and drive us south to the ancient city of Jaffa for lunch. We explored Tel Aviv on our own, and a lovely park near her apartment. Our conversations ranged from her early life on the Kibbutz to present day politics. One afternoon we drove to a nearby Arab village to meet her friend Khitam, and have lunch at the burger restaurant opened recently by Khitam’s son. Ruthie was gracious enough to host us for another two nights before we flew out of Tel Aviv. Our last Israel day was a relaxing one at the beach. A short train trip north brought us to Haifa and the warm hospitality of Tova and Israel who were attentive to us for the entire two night stay. Our personal interactions (over good food) are always a highlight of Servas, but also seeing places not on the typical tourist list. Our day trip to the ancient city of Akko was unique because it included the Tunisian Synagogue where every surface is covered with detailed mosaics. And next morning, before our bus to Nazareth, we visited another site I was not aware of in Haifa…the Baha’i World Centre and Gardens. Haifa is truly a city of many religions living peacefully together. Bob and I continued our travels with hotels, rental cars, and taxi tours, plus a three day tour to Jordan and Petra. We met fascinating people and saw main sights – too many memories and learnings to report here; but our Servas experiences continued as Israel had connected us with two local Servas Day hosts. Yafa K. picked us up at our hotel in Nazareth and drove us to the top of Mt. Tabor to visit the Church of the Transfiguration; the views were spectacular and we also enjoyed lunch in her village before our next bus south. We’ve learned that the sights are impressive but the sharing of life experiences and hopes are even more precious. Days later we had a similar experience in Jerusalem when Lesley and Meir fetched us at our hotel for a short tour and a fine Shabbat meal at their home. They were surprised when we noticed the sign at this viewpoint – funded by Canadians! 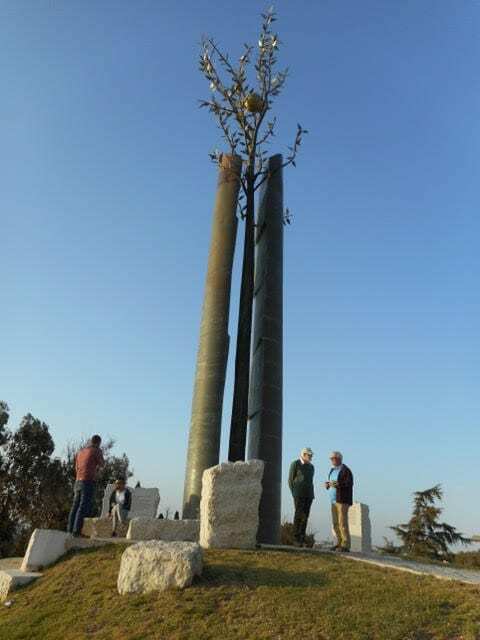 They also showed us this Tolerance Monument that so impressed me…a olive tree growing between two broken halves of a column…with a golden seed of tolerance in the middle! Will they eventually unite?